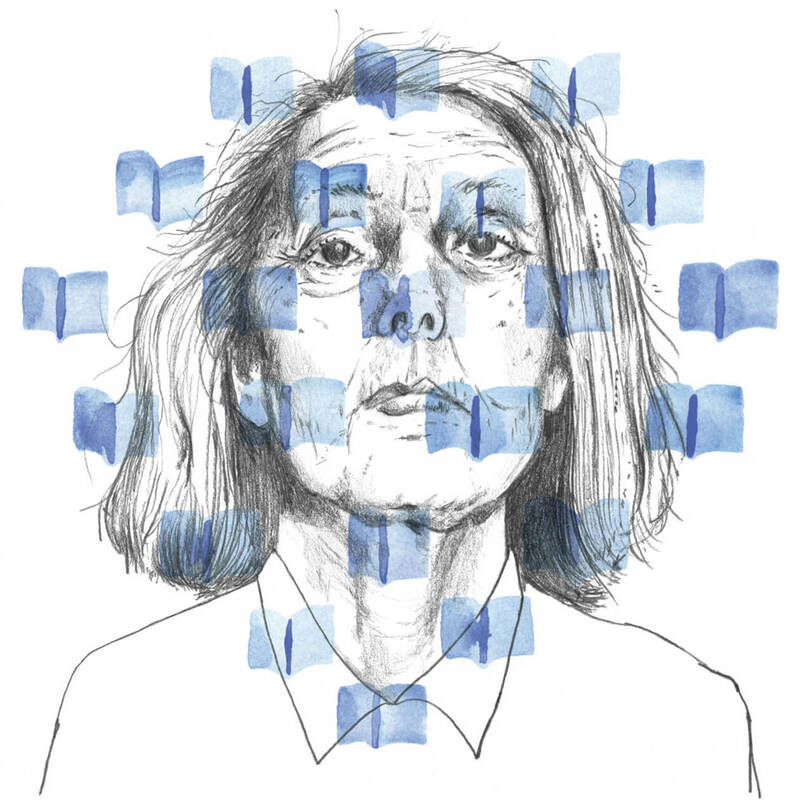 Page title: Is Anne Carson the First Poet with More Fans than Readers? People talk about a voice calling in the wilderness. All through the Old Testament a voice, which is not the voice of God but which knows what is on God’s mind, is crying out. While I am waiting you could do me a favour. Who are you? Carson’s answer to that question would make her a literary cult figure. In 1995, New York publisher New Directions—which backed the careers of some of the twentieth century’s legendary writers, including Dylan Thomas and F. Scott Fitzgerald—released Glass, Irony and God. The book’s genius lay in Carson’s decision to stop dividing her voice between her day job and her lyric moonlighting. The poetry was a bookish breakthrough: a college syllabus come to life. “The Glass Essay” is a long poem about a breakup, with asides about Emily Brontë’s spelling. “TV Men” features teleplay treatments for shows about Homeric characters and avant-garde poets. After a poem about God and Isaiah squabbling, there’s an essay exploring “the gender of sound”—with discussions of Gertrude Stein and Ernest Hemingway—in which she quotes Aristophanes: “Among the young men the ones who turn out to be terrific talkers are the ones who get fucked a lot.” In effect, Carson created a new way of talking about old ideas. Even the cover hinted at something big: a painting—by the poet—of a volcano erupting. And erupt it did. By 1995, Carson had made her way over to Random House and published a series of successful, uncategorizable books, penetrating mainstream culture in a way no poet had since Ireland’s Seamus Heaney. Her crossover smash hit, the “novel in verse” Autobiography of Red (1998), reimagined the myth of Hercules and the monster Geryon. Instead of killing Geryon and stealing his cattle, the ancient hero—here a little red monster who’s also an aspiring photographer—falls in love with him. It sold 25,000 copies. The accolades rained down: a Guggenheim Fellowship, a MacArthur “Genius” Fellowship, two Griffin Poetry Prizes. Endorsements from marquee authors such as Susan Sontag, Michael Ondaatje, Alice Munro, and Harold Bloom prominently adorned the covers of her books. There was even talk of a Nobel. It came as no surprise to many viewers of the TV drama The L Word when one character uses a book by Carson to seduce another into a make-out session. She was, by then, the coolest professor on earth—too cool, even, for a traditional bio. “Anne Carson was born in Canada and teaches Ancient Greek for a living” is all she was prepared to print about herself. But even coolness can become cloying. Carson began pursuing increasingly bizarre gambits. The odd-couple matches got odder. In Plainwater (1995), Carson summons the fifteenth-century Italian painter Pietro Vannucci so that he can attend a phenomenology conference. Men in the Off Hours (2000) sees Carson imagining that the Iliad has been adapted into a movie called The Peloponnesian War, on the set of which Thucydides chats with Virginia Woolf. Her book The Beauty of the Husband (2001) is subtitled “A Fictional Essay in 29 Tangos.” How many genres can you mix before your inventiveness waters itself down? Is there a limit to pretending there is no limit? The answer, it turns out, is yes. Carson’s poems stopped singing; the essays stopped thinking. The cross-pollination that had made her writing popular was now running to seed. Even the physical format of her collections reflected the chaos within. In 2009, Carson published Nox, ostensibly an elegy for her estranged brother. Instead, her expressions of mourning gave way to prosaic, meandering digressions on Catullus. The book is actually a narcissistic exercise in bookbinding: it’s a single accordion-folded page housed in a box the size of a cinder block. Carson’s new book is not a book. It’s a small-press fair. Weighing in at 272 pages, Float comprises twenty-two separate pamphlets that include both poetry and prose. In many ways, it’s a typical Carson production. The painter Francis Bacon rubs shoulders with Joan of Arc; Picasso and Gertrude Stein breathe the same air as Zeus and Homer. Still, it’s odd to see Penguin Random House publish our most famous poet in chapbook form—traditionally a vehicle for a young poet’s big break. It’s like Saks peddling pre-distressed jeans. Poor Lou Reed: that Thanksgiving wasn’t such a perfect day. The randomly broken lines, the dogged unmusicality, the affected, meaningless indentation. Nevermind floating, Carson’s new book rarely achieves liftoff. But that’s now beside the point. Bad writing can do nothing to curtail Carson’s fame—because that fame no longer depends on good writing. In the essay “Variations on the Right to Remain Silent,” she writes, “To sum up. Honestly, I am not very good at summing up,” before concluding with seven translations of the same poem. It’s wry and cheeky, and an utter cop-out. Luckily for her, there’s one place where Carson’s ambivalence toward any kind of “summing up” gets a free pass: English departments. Carson is popular because she has given poetry back to the only people who still want it—academically educated poets. Her fame coincided with poetry’s extinction in the wild. Gone was the general readership that Robert Frost, W. H. Auden, and Sylvia Plath once enjoyed. Poetry retreated into fine-arts programs and comparative-literature departments: it now survives only in captivity. In other words, Carson is the poet we deserve. Two hundred years ago, in his preface to the Lyrical Ballads, William Wordsworth wrote that poetry should cleave “near to the language of men.” Wordsworth’s own verse hums with the mental energy of the ordinary readers who inspired him. In a weird way, Carson may be just as representative of our own time and of her main readers: arts and humanities graduates with more student debt than talent. Carson now produces “texts”—genre-less, amorphous pieces of writing. Her abstruse, down-tuned music is the soundtrack to poetry’s institutionalized life in the twenty-first century. What we want from poets such as Carson isn’t unforgettable language—once one of poetry’s most important aims—but accreditation. Admiring Carson has become a genre unto itself. When the fictional women on The L Word hook up thanks to their shared admiration of the poet, one tells the other: “I think those books practically changed my life.” It’s the sort of endorsement that could easily have appeared on one of Carson’s covers. Fifty years ago, lovers wouldn’t have needed to trade testimonials about Auden to quicken a moment. One would have simply whispered to the other, “Lay your sleeping head, my love, / Human on my faithless arm.” Auden wasn’t celebrated because he changed lives, but because he wrote lines that were memorized and shared. Carson’s name is a password that confers membership in one of our trendiest social clubs; reciting the actual poems—with their imprecise images, dead-end fragments and clichés—would be a buzzkill. Instead, we remember the blurbs. That’s why it’s absurd to wonder whether “Lou’s Grace” is the best Carson can muster about one of our best songwriters. Its lines are secondary to their occasion. Carson, once the obscure academic essayist, has become the poet to elegize the Velvet Underground front man, around his own dinner table—and makes damn sure her readers know it. At sixty-six, Carson may be the first poet to have more fans than actual readers. She is like the World’s Most Photographed Barn from Don DeLillo’s novel White Noise, which people come to in order to be seen to have seen, but can no longer actually “see” for themselves.